Discover how easy it truly is to go paperless with your tax and licensing process procedures and start saving time, money, and frustration. Our founder, Erin Neer, has been working in municipal finance for over 16 years. As a former finance director for a town in Colorado, she realized that the way sales taxes were collected was archaic. She was incredulous that businesses were still sending in manually calculated paper coupons to remit their taxes – and, even worse, that the city staff then had to handle that mail, key in the data and make a deposit to the bank. So, Erin created a solution: MUNIRevs. 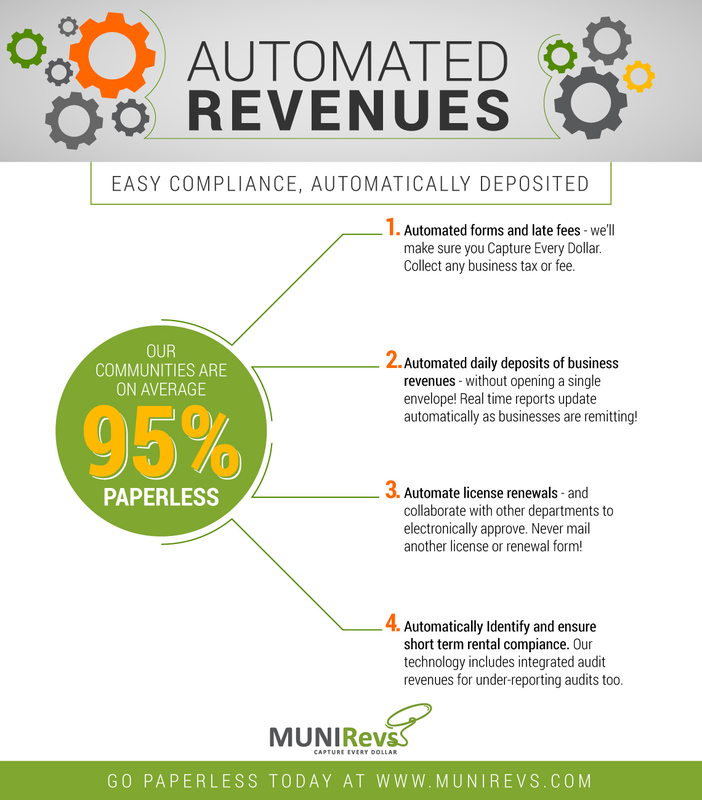 Established in 2011, MUNIRevs works with communities to automate their business revenue collection. Backed by a lifetime of experience in municipal finance, our team has revolutionized the tax and licensing process. Adding up to almost $400 million in paperless revenue in just six short years, we have become the trusted source for payment processing, allowing residents the ease and convenience of on-time payment while helping cities and states eliminate approximately 95 percent of the manual data entry tasks. Furthermore, each of our valued team members was hand-selected for their experience in both tax accounting and customer support. Providing attentive, knowledgeable guidance that is prompt and courteous, our customer support specialists are our driving force, providing expert care to each and every one of our 20,000 customers, from right here in the United States. As an added service, we also turn our expert attention to helping those in the vacation rental industry. Providing helpful guidance and accounting services to lodging and short-term accommodation providers, our tax professionals help owners and managers reconcile ledgers and achieve full compliance through systematic audits.